CULLMAN – Over the weekend, Cullman celebrated what has become a unique tradition in Alabama: the state’s last courthouse singing convention. 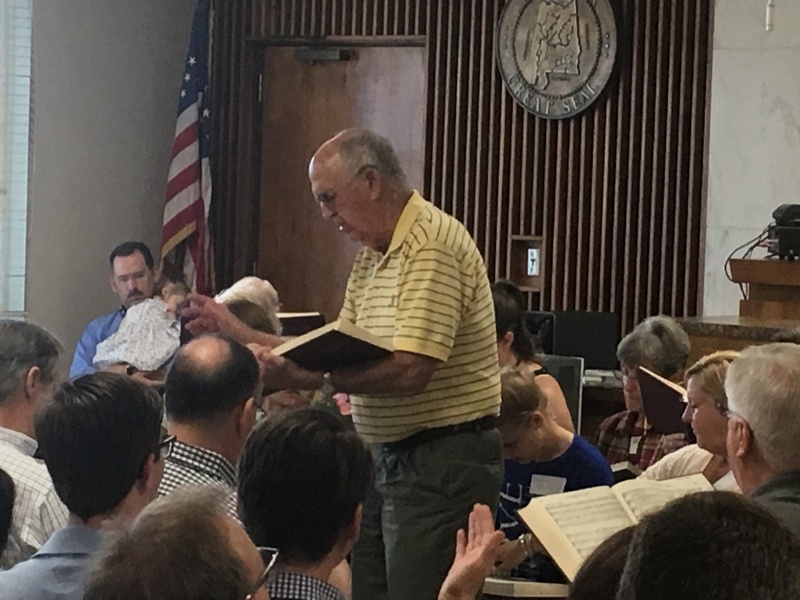 Singers from all over the state, and some who drove or even flew in from other parts of the country, filled the Cullman County Courthouse’s district courtroom to standing-room-only capacity, leaving some casual listeners to sit out in the hall. The 125th annual singing convention continued a southern tradition that began in 1893. Both days included free potluck dinners at noon for singers and listeners alike, another singing convention tradition. Between the two sessions, everyone was invited to two local singers’ home for supper, fellowship, and of course, even more singing. During the fellowship, a few singers talked about what Sacred Harp and the singing convention culture. “I’ve been around Sacred Harp singing since I was just a boy. There was an old wood-frame church house, Valley Grove Church, adjoining our property. They had a meeting there once a month, on the fourth Saturday and Sunday. They’d have Sacred Harp singing there once or twice a year. We’d be out working in the field, and we’d hear that singing across the woods.